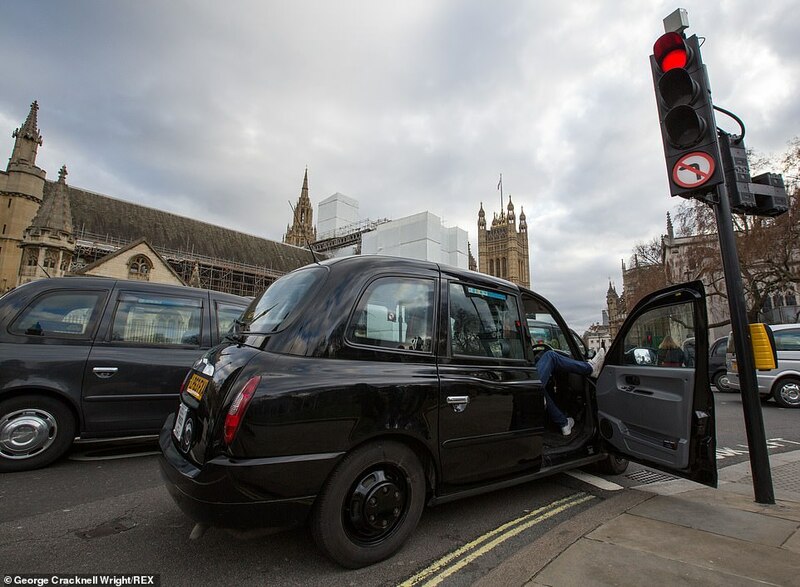 Black cab drivers brought parts of central London to a standstill today as they continued their ongoing protest about the Mayor of London’s plans to ban them from driving on roads in parts of the capital. 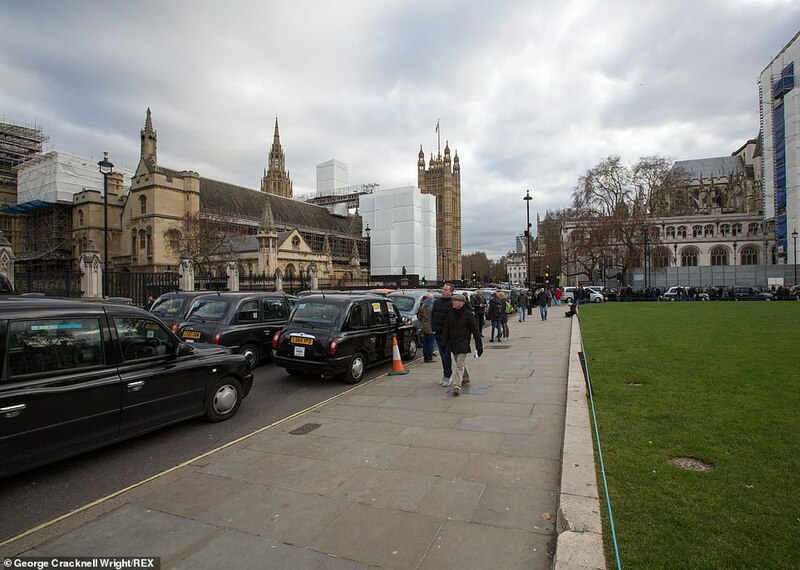 The drivers caused gridlock for the third time in a week by lining their cars along Parliament Square and surrounding streets. 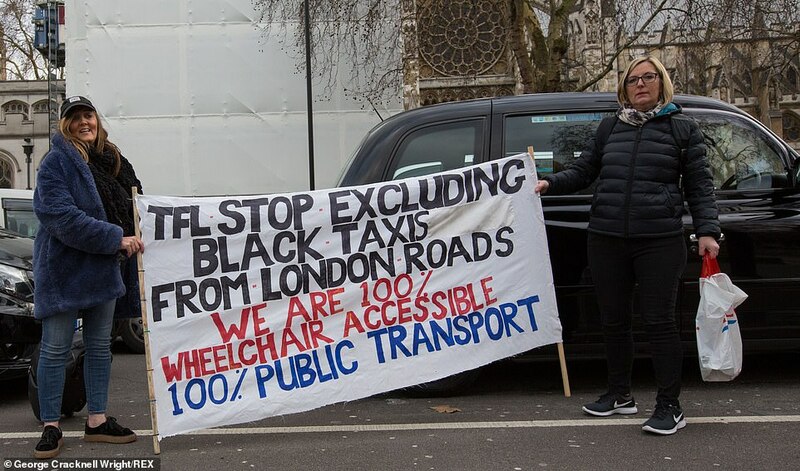 The cabbies are demonstrating against plans – supported by Sadiq Khan and Transport for London – to make key routes in the capital open to only buses and bikes. 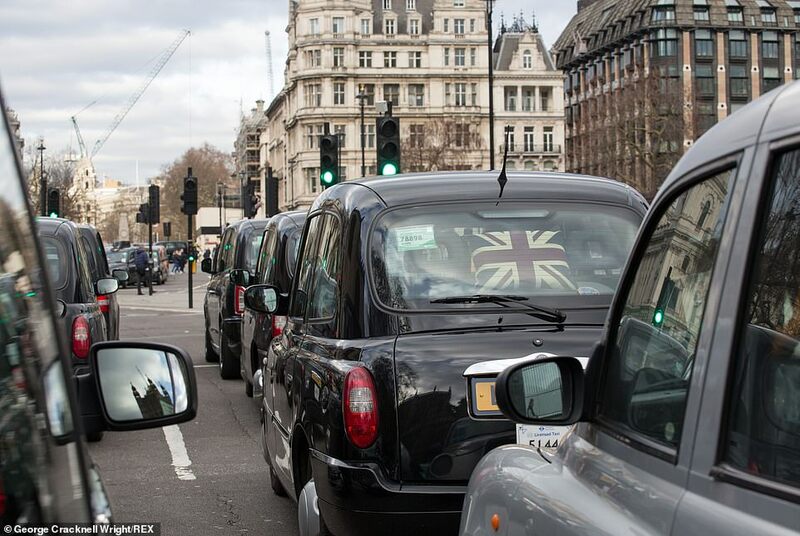 The black cab caused gridlock for the third time in a week by lining their cars along Parliament Square and surrounding streets. 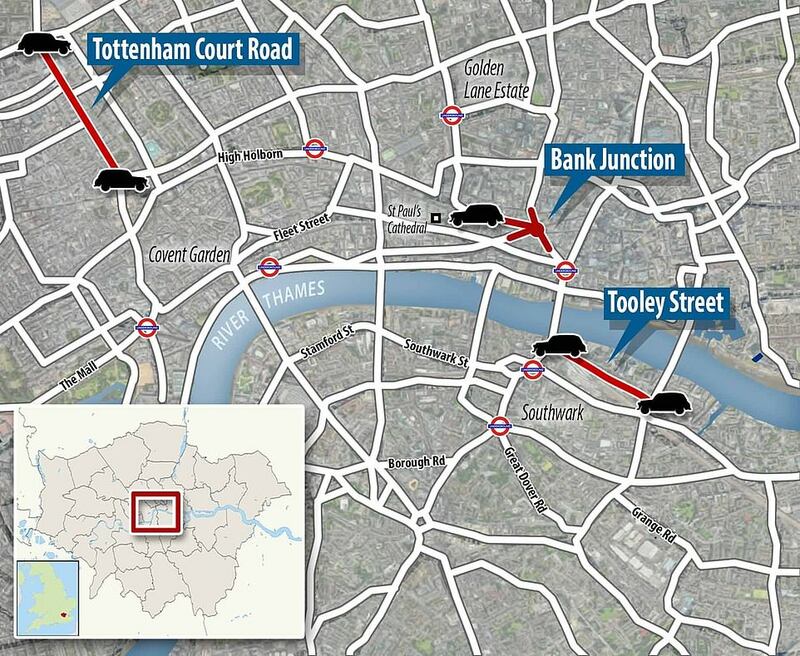 All other vehicles, including black cabs, will be banned from roads including Tottenham Court Road, Tooley Street near London Bridge and a major junction in the City of London. Cabbies, many waving placards declaring ‘where buses go, we go’, demand to be allowed to use the roads as well. 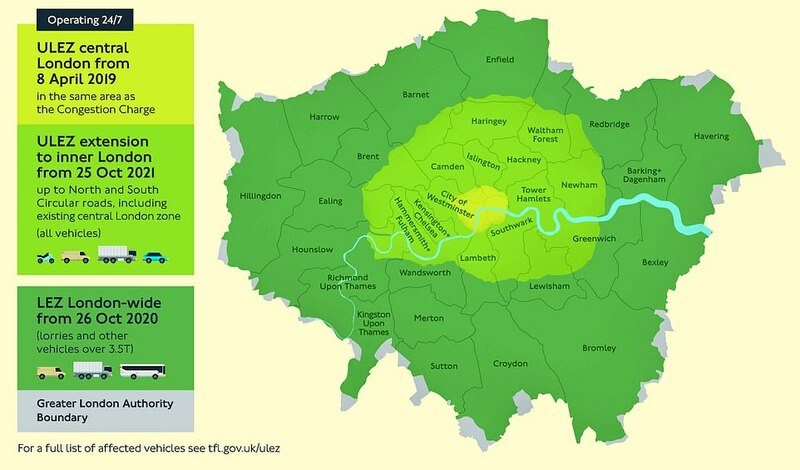 The controversial road changes are driven by individual London boroughs, but are supported by the mayor-controlled TfL as part of City Hall’s desire to clamp down on air pollution. They include Camden Council’s £35million project to reduce congestion and improve air quality by banning cars, lorries and black cabs from Tottenham Court Road. Only buses and bicycles will be permitted to use the road between 8am and 7pm from Monday to Saturday, with drivers who breach the restriction facing a £130 fine. Southwark Council is also proposing to change the layout of Tooley Street near London Bridge which would see a section of it restricted to buses and cycles only. There is also anger by drivers over the decision in 2017 to ban all traffic except buses and bicycles from Bank junction in central between 7am and 7pm on weekdays. The drivers believe that bans on them using the roads are threatening their livelihoods and could make congestion and levels of pollution worse. The plans form part of Labour mayor Mr Khan’s ‘Healthy Streets’ strategy which aims to enable more people to walk, cycle and use public transport by making London’s streets healthier, safer and more welcoming. Ben Plowden, director of strategy and network development at TFL, said: ‘The Mayor’s Healthy Streets programme is making London’s streets more attractive, accessible and people-friendly, encouraging Londoners and visitors to walk, shop and enjoy their streets. 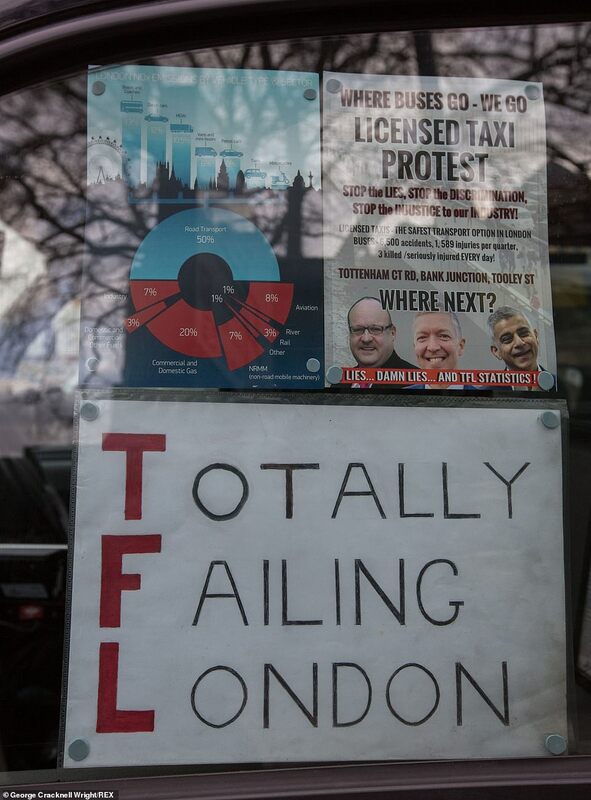 Some of the taxi protesters appeared to be objecting to being made to pay the mayor’s new Ultra-Low Emission Zone charge when it comes into force in April. But TFL have confirmed on Twitter that black cabs will be exempt from the £12.50 charge – although most other vehicles will have to pay it. Last year, Mr Khan implored the government to give him the power to put a New York-style cap on how many licensed vehicles are allowed on London’s streets. In a letter to transport secretary Chris Grayling, Mr Khan said back in August: ‘Unlike New York, I don’t have the power to cap the number of private hire vehicles in London. Tens of thousands of cars and vans will face daily pollution charges of £12.50 in London as Mayor Sadiq Khan confirmed plans for a large-scale emissions zone. 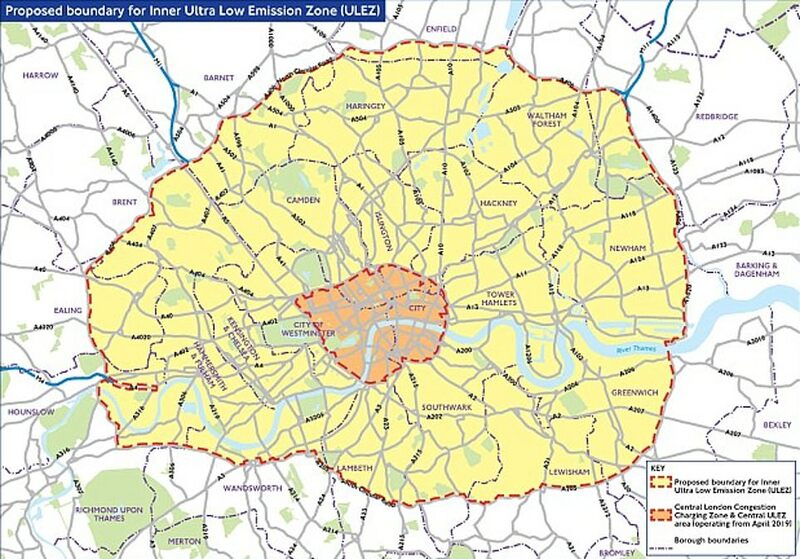 The ultra-low emission zone, being brought in for central London in April 2019, will be expanded to the North and South Circular roads from October 2021, Mr Khan has announced. Last month the Daily Mail reported on the case of Ella Kissi-Debrah, a girl who died aged just nine years old following a battle with asthma. The youngster died six years ago after attacks that were linked to pollution spikes near her home in Lewisham, south-east London. Her mother, Rosamund, has spent four years since first inquest fighting to reduce toxic fumes. The child lived just 80ft from a notorious pollution ‘hotspot’ on London’s South Circular Road. She visited five different hospitals 27 times collectively within three years after having multiple seizures. Professor Stephen Holgate of University Hospital Southampton said last year there was a ‘real prospect that without unlawful levels of air pollution, Ella would not have died’.